Third parties generally fail in the United States. The game is rigged. We have plurality-take-all district-based elections. We have ballot access requirements that are burdensome to small parties. We have media that focus on the horse race aspect of elections vs. the principles at stake. So, do we give up on the third party option? Do we leave power in the hands of the Democrats and Republicans? Do we allow this country to drift further into bureaucracy, corruption and fascism? Must we fight these baneful trends by working through the existing two-party system, bootlicking our way to the top? It is impossible for Man to fly. This statement used to be true! But then, inventors eventually discovered exceptions to this rule. They found that by building balloons or airplanes that human flight was indeed possible. But note that human flight was not achieved through wishful thinking, complaining about the unfairness of nature, or simply trying harder at approaches that had failed for centuries. Human flight by attaching feathers to arms and the like is still impossible. It took new approaches. It took study of the existing laws of physics and working within those laws. There is reason to believe that the same holds for successful third party politics in the United States. Existing approaches have failed and will continue to fail. But a careful study of the dynamics of the American political system reveals special cases where a third political party can be competitive with the two major parties. More importantly, these special cases are non-trivial. There are several niche opportunities for third parties to provide beneficial competition to the Democratic and Republican parties, thereby reducing corruption and introducing new ideas. And there is at least one niche that is large enough to produce a new major party, one potentially competitive at the presidential level, possibly eclipsing one of the existing major parties. The Libertarian Party could opt to fill the large market niche, become a major party, and in the process move this country towards smaller government and more freedom. Likewise, the Green Party could opt to fill this market niche, become a major party, and in the process clean up the environment and reduce corporate power. I think the Constitution and Free State parties are less well positioned to fill the large market niche, but I could be wrong. However, they could be effective in the aforementioned smaller niches. I invite the leadership of any and all of these parties to read this document and profit accordingly. And if one of these parties opts for the big niche, I will most likely join that party. That said, I am not going to wait for you. I have just spent close to 2 years in a concentrated effort to reform the Libertarian Party in order take advantage of the large opportunity. The result was very limited success in changing the platform at the cost of exhaustion, financial loss, and many personal attacks by those who defend the status quo. 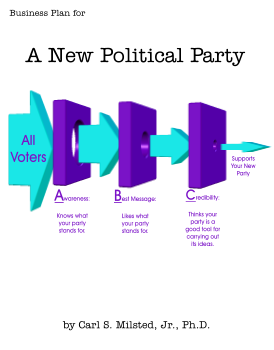 While the Libertarian Party has much infrastructure in place, it also has bad branding to live down, bylaws making it difficult to make fundamental changes, and many members who joined the party because they like it the way it is. The LP may yet come around, but not through me pushing it. As for the Green and Constitution Parties, I have no status or experience within them. If you are an activist within one of these parties and have success selling these ideas, let me know. In the meantime, I intend to float some ideas for a new political party, one set up from the start to take advantage of a golden opportunity. This document is a business plan for setting up this new party. But it can also be a plan for revamping one of the existing parties, should the leadership of one of these parties see fit to take advantage of the opportunity. This is both a plan for reform and a plan for starting from scratch. As such, I have organized this document with the desired end stage first, and issues related to starting from scratch last. I recommend reading the chapters in order. Those working within an existing party can skip the final chapters. Introduction. You�re almost finished reading it. Working Within the Constraints. Why third parties have failed in the past and the special cases where success is possible. Strategic Framework. What are the bottlenecks to third party success? This chapter provides a framework for strategic planning for any third party. This framework will be referenced with particular examples in the next two parts. Lessons Learned in the Libertarian Party. I have been an LP member for a quarter century, and extremely active during the last seven years. Herein is a collection of lessons learned during this time. Many of these lessons are applicable to other third parties, including a new party. Starting from Scratch. Starting a new party is hard. You have limited resources to get the message out, and those who hear your message don�t take you seriously since you are small. Here are some thoughts on how to bootstrap starting with very limited resources. Included are some specific proposals for possible new parties.